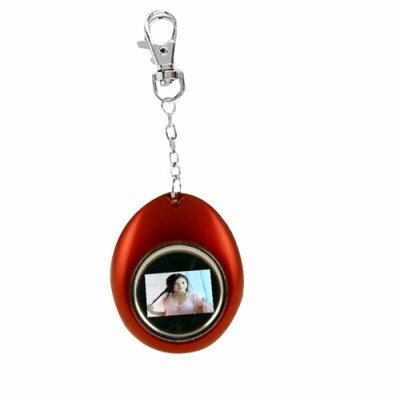 Successfully Added Red Digital Photo Frame Keychain with 1.1 Inch Screen to your Shopping Cart. Red Digital Photo Frame with 1.1 Inch Screen for carrying on your keychain, hanging on your phone or handbag, or attached to your backpack. This model has a smooth, curved casing along with a 1.1 inch PCBA viewscreen viewing panel that allows for rough handling without breaking. The mini digital viewer has a high-quality 56k rich color display along with internal flash memory for storing photos (about 70 resized photos - pictures are re-sized to 96X64 with the included software). A built-in battery provides days of standby mode life. The included metal chain style attachment clips onto most keychains and bags securely. Take advantage of our factory direct wholesale price to buy some for yourself and then order more to resell at your online shop. This item is a continuing best-seller during the holidays and throughout the year. Order your stock today and we will ship it out to you tomorrow!. Experienced computer users can find many full featured open source software to re-size their favorite photos to 96X64. The included software only has basic resizing functions.